October is usually one of my favorite months of the year. There's Halloween, of course, and then there are quite a few birthdays in my family to celebrate too. But this year I spent most of the month in bed with a flu that turned into bronchitis which turned into bronchial asthma. I'm just now getting over the whole sorry mess and am back to work. I missed everyone, as I didn't get to blog much and frankly I was not in the right frame of mind to sit down to write, but I did read quite a lot while in bed and in between naps and such. I finished a few books from various genres, but if you look at my list the bulk of my reading was taken up by LGBT reads. Anyway, I read some fabulous books, as well as some that were not so great, but then that's the chance a reader takes when reading so many books in one month, and that's fine with me. I read a few new releases that will probably make it to my "best of" list at the end of the year, some memorable B+ books, and one with such an interesting introduction that I actually wanted to write a post about it. And let's not forget about those amazing older releases that were lingering in my TBR that turned out to be fantastic. Reading the Nick Nowack Mysteries led me to reread the Adrien English Mysteries and I went on one of those never ending loops of rereading the series for a few days. I loved every minute of it. I forgot how much I enjoyed each of the mysteries, the gorgeous retro atmosphere in this series and how much I really love Death of a Pirate King. What I found in the end of this cycle was that I kept looking for more from or for Jake and Adrien, than what is actually on the pages of those books. And because I needed some chicken soup (contemporary romance), I picked up My Best Worst Mistake by Mayberry and gobbled it up while sniffling and taking my temperature. It was as great a read this time as it was the first time around. Looks like you have gotten alot of books read. I just got the Mackenzie book, so I hope to read that one soon. Renee, yes... lots of books! The Mackenzie book was a great read for me, I hope you enjoy it. I just finished the new Maiden Lane book by Hoyt and loved it too. Have you read it yet? Wow, it's harsh being that ill but at least you got time for plenty of reading. Whoa! So sorry to hear you were sick like that. I hope you'll continue to be feeling much better. Good thing there was an upside in all that reading! Yikes Hils! Sorry to hear the flu hit you so hard. It's been quite nasty all around this year. I'm really glad you're feeling better though, and finally up and about. Ahhh the never ending loop of re-reads! I do it all the time with favourite books, especially when I'm in a reading slump or coincidentally when I'm sick in bed - beloved books bring comfort. 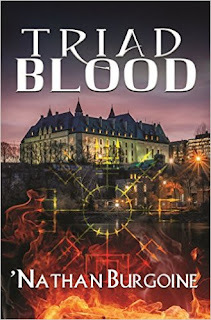 I've re-read the Nick Nowak Mysteries twice, and will probably be doing so again with some of the books real soon as I pen reviews for Books 3-5. Absolutely love this character and his story. I loved 'Nathan Burgoine's Light as well - such a fun and feel good read! Meriwether's The Silent Hustler has been in my TBR for years and I'm quite interested in reading Mel Bossa. I've had her first two books Split and Frankie Gets Real in my TBR for a while. Hoping to start my new year's reading with this author. Take care and I hope you continue feeling better. Indie, it was nasty! But I'm back to work and productive again, so I'm grateful. I've only ever done those rereading loops with comfort reads, or books that tend to obsess me, you're right. It had been a long time since I reread the AE mysteries and found little details that I'd forgotten. Loved them all over again, and then when I finished them went back looking for other details… lol! It was fun, but I only broke the cycle by reading the Mayberry, another favorite. Thanks for recommending the Nick Nowack Mysteries by Nowack, I foresee one of those rereading loops in the future for this series. I love it! I inhaled Light by Burgoine. It was just what I needed to read at the time because it was so much fun and it left me with a smile on my face. A happy read! And Indie! I've had The Silent Hustler in my TBR forever too! I'm sorry I didn't read it before and definitely recommend it to you. That is one smart, gorgeous collection. I know you will appreciate Meriwether's writing skills. PS: Have you read Dale Chase's collections of Western erotica? I know you love your cowboys and she's just the best! CORRECTION: the Nick Nowack Mysteries by Thornton! LOL! Thank you for stopping by. It's my pleasure to recommend The Silent Hustler. It is a fantastic collection.